I think one of the reasons I was so struck by this hymn was that for several months now I have been closing my prayer time in the morning by asking God to give me a grateful heart, a generous heart, a compassionate heart, and a humble heart. And while I have a long way to go in terms of these things being a part of my life, I want to believe that when I heard this beautiful Hymn of Thanks, God was giving me a sign that I am on the right track. In a world where so much is available to us at the tips of our fingers, it is hard sometimes to remember that all that we have and all that we are comes to us from our loving God. Now certainly many of us work long and hard. We are used to making our way in the world, and earning our passage. All of this is possible, though, only because our God first loved us into being and gave us the talents, the abilities, and the resources we need to succeed and to flourish. When we focus, though, only on our own efforts and consider only what we don’t have and/or what we still want, it can be hard to remember, let alone to feel gratitude. And yet, we could accomplish nothing, if not for the completely gratuitous love of God. Developing a grateful heart is at the core of our relationship with God. How do we develop a grateful heart? Well, while I believe this is the task of a lifetime, I also believe it begins by asking God to help us want to be grateful. I am more and more convinced that unless we want to do something, we are not apt to do it. So we need to begin by asking God to help us want to be grateful. We then need to acknowledge those things for which we need to be grateful. And we need to close the loop by asking God to help us be grateful—not just when it pleases us—but at all times. At times gratitude is instinctual. More often, though, I think it is a behavior that we learn through prayerful practice. Given this, may we who have been given so much, remember to ask God for one thing more—a grateful heart—not thankful only when it pleases us, but a heart whose pulse may always give God praise. Over the years, I have amassed a substantial collection of nativities. New to my collection are several images of Jesus, Mary and Joseph on their way to Egypt. Some depict the Holy Family in the traditional way with Mary sitting on a donkey. She holds the baby Jesus in her arms. Joseph leads the donkey. Others are less traditional depicting them in a boat, in a car or on a plane. Regardless, in each of these cases they are on a journey. Theirs was a journey that led them from danger to safety; from darkness to light; from death to life. The Holy Family’s journey exemplifies our own journey, for life indeed is a journey. For some people it is a long journey. For others, it is short. Some people’s journey is straightforward. Other people’s journey may be more circuitous. Some people’s journey is easy. Other people’s journey can be very difficult. But what all of us share is that we are on a journey from birth to burial. The Year of Mercy which we began December 8th is an invitation to all of us to rediscover this sense of restlessness; a sense that we don’t really belong; a sense that we are strangers; a sense that we are not at home, yet. The Year of Mercy offers us an opportunity to break out of our complacency and rediscover the riches and the challenges of the Gospel. The Year of Mercy invites us to renew our spiritual journey or pilgrimage. I love looking at the sculptures I have of the Holy Family. Each one is different. One of them is from Mexico, another from Kenya, another from Palestine… in each one of them the Holy family is depicted in the image of the people who made them. It is a constant reminder to me that The Holy family’s treacherous journey is a pre-figuration of all our journeys. The journey and indeed, the entire life of the Holy family is a symbol of the life-long pilgrimage all of us are asked to undertake. May we be inspired by their faith, their trust and their endurance. So, let’s pack our satchel and continue our pilgrimage from darkness to light; from death to life as we journey to that Promised Land where we will be strangers no more. Over the years, I have amassed a substantial collection of nativities. New to my collection are several images of Jesus, Mary, and Joseph on their way to Egypt. Some depict the Holy Family in the traditional way with Mary sitting on a donkey. She holds the baby Jesus in her arms. Joseph leads the donkey. Others are less traditional depicting them in a boat, in a car or on a plane. Regardless, in each of these cases they are on a journey. Theirs was a journey that led them from danger to safety; from darkness to light; from death to life. The Year of Mercy, which we began December 8, is an invitation to all of us to rediscover this sense of restlessness; a sense that we don’t really belong; a sense that we are strangers; a sense that we are not at home, yet. The Year of Mercy offers us an opportunity to break out of our complacency and rediscover the riches and the challenges of the Gospel. The Year of Mercy invites us to renew our spiritual journey or pilgrimage. I love looking at the sculptures I have of the Holy Family. Each one is different. One of them is from Mexico, another from Kenya, another from Palestine… in each one of them the Holy family is depicted in the image of the people who made them. It is a constant reminder to me that The Holy Family’s treacherous journey is a pre-figuration of all our journeys. The journey and indeed, the entire life of the Holy Family is a symbol of the life-long pilgrimage all of us are asked to undertake. May we be inspired by their faith, their trust, and their endurance. If you've been to The Basilica at Christmas, you know it is a celebration you will remember forever. But we'd like to make this visit as easy as possible for you. Below are answers to a few frequently asked questions. A: While there are a variety of places to park, we do recommend you plan ahead. Handicapped Parking is available in the Basilica surface lot off 16th Street. There is also handicapped parking along 17th Street and in the parking lot under the freeway on the west side of the Basilica. Parking is free beginning at 2:00pm on December 24, Christmas Eve through Sunday, December 27. This ramp is located at 1420 Hennepin Ave. S. The entrance to the ramp is off Laurel Avenue. Parking is free on 17th Street in designated "Basilica Parking Only" areas. All Basilica parking lots are also available for parking. Q: Is there a Handicapped Accessible Entrance? A: Yes. The best accessible entrance is located on the ground level of the church on the west side (click here for a picture). There is also a step free entrance on the east side of the church, however, the door is a manuel door. Q: Do you have wheelchairs available for use? A: Yes. Wheelchairs are available in the rear of the church at the main entrance off Hennepin Avenue. Q: Does Midnight Mass really start at midnight? A: Yes. Music for the midnight Mass begins at 10:30pm. Many guests and visitors come to The Basilica early to enjoy the beautiful music and decorations prior to the service. Q: Can I hold a seat for a friend or family member? A: We work hard to seat all our guests inside The Basilica at Christmas. If there is additional space available for incoming guests, our ushers will seat guests on a first come, first served basis. 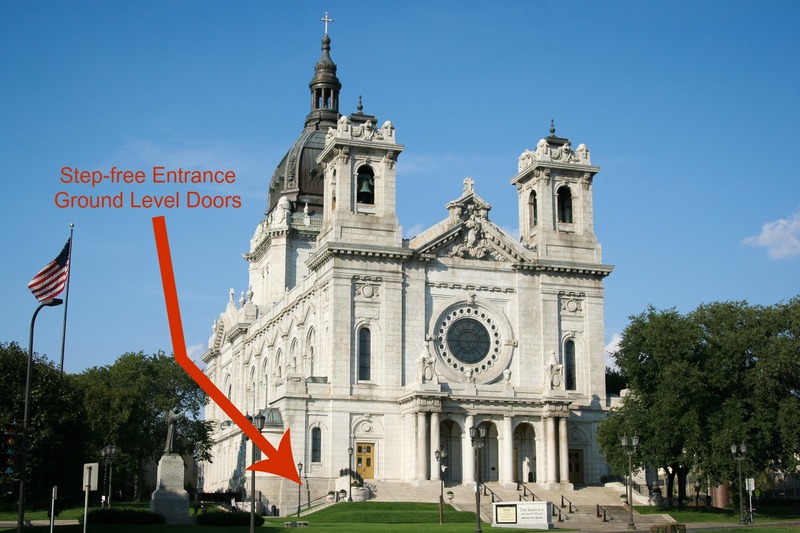 When inside The Basilica reaches capacity, please know that we provide the hospitality of overflow seating on the lower level of The Basilica by closed circuit television. Q: Are pictures allowed during the service? A: We ask that you please be respectful of those around you during the Mass. Basilica staff will be documenting the service and providing images on our website, Facebook, Twitter, and Instagram accounts. If you'd like to relive your experience after the Mass, we invite you to visit us online. If, however, you do take a stunning picture before the Mass begins, please share with us online! Q: What type of music will be offered at each Mass? A: Please see the information below about all our services. On September 13, 2015 we ended Mass by processing to the most western doors of the Basilica’s façade. Covering that door was an image of the Divine Mercy. We paused and prayed for God’s mercy on all of us and declared the doors closed until December 13, 2015 when we opened these Holy Doors in celebration of the Holy Year of Mercy. The opening of the Holy Doors was a beautiful celebration. After reading from the Proclamation of the Holy Year of Jubilee by Pope Francis we processed to the Holy Doors while singing the Veni Creator Spiritus. Fr. Bauer pronounced the prescribed Psalm verses and opened the Holy Doors. Immediately the Te Deum was sung and nearly everyone in attendance entered The Basilica through our Holy Doors. At least since the mid-15th C. the major Basilicas in Rome (St. Peter, St. John Lateran, St. Paul-outside-the-Walls and St. Mary Major) have had a designated Holy Door. In order to avail the spiritual benefits of a Holy Door to the entire church Pope Francis has extended this privilege to all Cathedral churches. Thus, for the first time in the history of The Basilica of Saint Mary we have been granted the privilege of a Holy Door. Doors mark thresholds and provide entryways. Some doors lead to great beauty. I marvel at the faces of our guest who walk through the Basilica doors for the first time. Some doors lead to freedom. Just think of refugees who walk to freedom through the doors that lead into our country. Some doors lead to sanctuary. Illegal immigrants, e.g. walk through church doors in the hope of finding sanctuary. Doors can also present barriers and blockades. The gates to our church sanctuaries were intended to keep the non-ordained out. The gates we have at our boarders are intended to keep unwanted people out of the country. And gated communities take their name from the gates that allow certain people in and keep others out. It is this human experience of doors that inspired our Judeo-Christian experience of the gates to Paradise and the gates to Hell. Our hope and prayer is to enter the former which lead to eternal bliss and avoid the latter as those lead to eternal damnation. There is nothing magic about passing through these doors rather it is a profoundly symbolic act which embodies our faith and our commitment to Christ. When we walk through these doors we acknowledge that Christ is indeed the door to paradise. At the same time we commit ourselves to living according to the Gospel and to open doors to others as Christ has opened the Doors to Paradise for us. In a sense, the Jubilee Year of Mercy is all about opening doors. The Holy Doors in all the catehdrals thoughout the world are most important, however they are also symbolic of many other doors which need to be opened. As Pope Francis opened the Holy Doors of Mercy he asked that in response all of us open the doors to our hearts, the doors to our homes, the doors to our country, the doors to our churches. Only when we are willing to do so will his great wish for the Year of Jubilee be realized: a Revolution of Tenderness. Since the beginning of time, people of faith have searched for the God who had left so many proofs of His existence, yet had always remained hidden from sight. His presence was real, yet always mediated through created things, and therefore always elusive. And then, in the fullness of time, all that changed. While all was quiet, in the deep stillness of a winter night, God came to a small country town and dwelt among His people in human form. God’s presence was no longer mediated and mysterious, but now real and actual. It was first noticed by shepherd folk with keen ears and star gazers with sharp eyes. Yet soon a waiting world was to know of this miraculous event. And down through the centuries believers of every age have continued to search for and discover God made manifest in that tiny infant born in Bethlehem. Today we celebrate the birth of Christ, not as a past event, but as a living reality. For we believe that God did not come to dwell among us once long ago and then return to heaven. God continues to abide with us. He is Emmanuel—God with us now and always. May we attune our eyes and our ears as we seek to discover the living God present among us. May we open our hearts to his presence and love. And may this Christmas be a time for all of us to recognize anew the presence of God revealed to us in our newborn king, Jesus Christ. On Sunday, December 13, The Basilica of Saint Mary staff hosted a reception to honor all our volunteers from throughout the past year. Over 200 people attended the reception, which included appetizers, desserts, and comments of appreciation from the staff. We are so grateful for the work and leadership from all of our volunteers - The Basilica could never be the same without you! If you haven't volunteered at The Basilica, learn how you can get involved here. The Holy Doors at The Basilica of Saint Mary opened December 13 to a crowd of nearly 1,000 people. During the service, the congregation heard the follow segment from the papal proclamation of the Extraordinary Jubilee of Mercy by Pope Francis and also passed through the Holy Door after it was opened at the beginning of the service. Then, the congregation renewed their baptismal promises before the start of the Mass. Jesus Christ is the face of God’s mercy. These words might well sum up the mystery of the Christian faith. Mercy has become living and visible in Jesus of Nazareth, reaching its culmination in him. Jesus of Nazareth, by his words, his actions, and his entire person reveals the mercy of God. Mercy is the word that reveals the very mystery of the Most Holy Trinity. Mercy is the ultimate and supreme act by which God comes to meet us. Mercy is the fundamental law that dwells in the heart of every person who looks sincerely into the eyes of all those on the path of life. Mercy is the bridge that connects God and humans, opening our hearts to the hope of being loved forever despite our sinfulness. For this reason I, Francis, have proclaimed an Extraordinary Jubilee of Mercy as a special time for the Church, a time when the witness of believers to the riches of God’s Mercy might grow stronger and more effective. For more information on the Year of Mercy at The Basilica, visit us here.